A few weeks ago I visited Mount Rainier National Park in the hopes of viewing a full display of wildflowers at the Paradise area of the Park. Unfortunately, this was not to be as clouds obscured the mountain from the Paradise side and most of the Tatoosh Range for the duration of my stay. However, I did come away with many photographs I am quite happy with. As is the case with many of my visits to the park, the weather has changed my plans – but as always there are all manner of great things to photograph near Rainier. I was fortunate to be at Rainier during the same time as photographers Rob Tilley and Gary Hamburgh. After we met up at Paradise we decided that a trip to Narada Falls would be better than dealing with the clouds at Paradise. 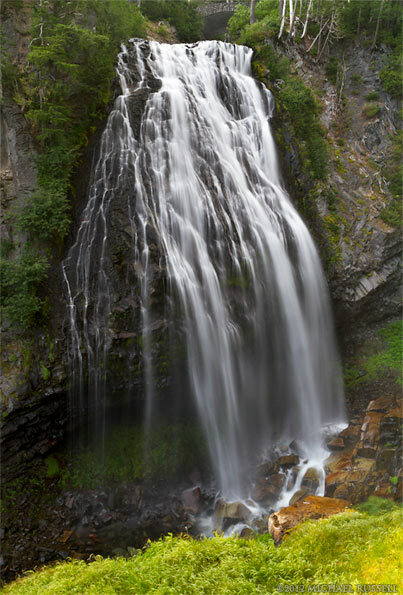 I have always found the short walk down to Narada Falls to be worth it regardless of the weather. I don’t always photograph there but I found the lower water levels of a few weeks ago photographically interesting. They also came with much less spray to keep off of my lenses and camera. 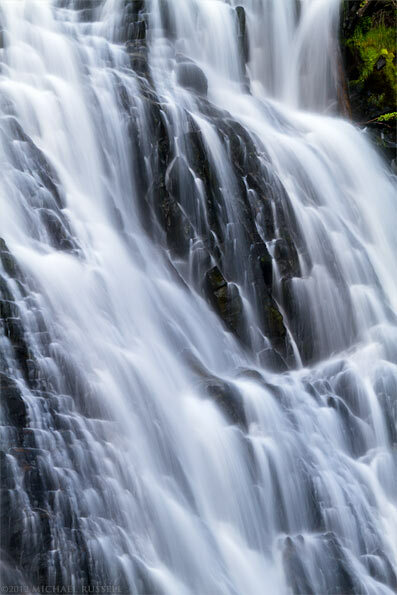 After trying a successful experiment at Eureka Falls I’ve been using my 70-200mm lens to focus on the details of many waterfalls I have encountered. I still enjoying the overall view of a waterfall, but sometimes cutting out the extraneous details can be a more visually pleasing photograph.